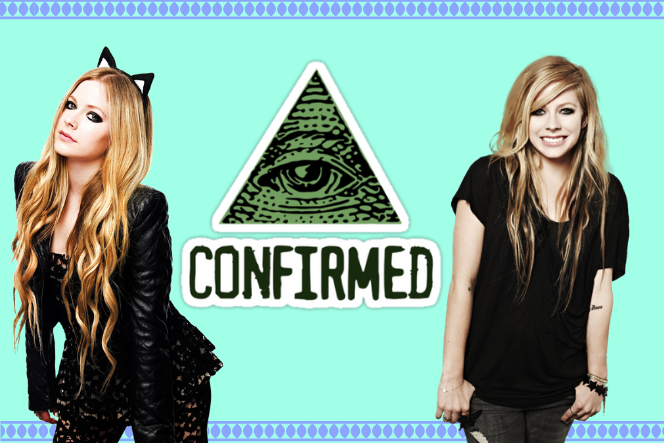 A conspiracy theory that Avril Lavigne was killed in 2003 and was replaced by a lookalike is circulating the internet (Twitter in particular)- again. Rumour has it that Melissa Vandella replaced the Canadian pop-star and even released songs under her name, including Girlfriend and Slipped Away, and there’s a ton of evidence to prove it (apparently). Details of the conspiracy, which has circulated the internet since 2004, vary by source. The general consensus, however, is that in 2002, following the release of her successful debut album, Lavigne couldn’t handle “the pressures of fame” and thus employed a body double, Melissa Vandella. After this point, the theories split. Some say Lavigne fell into a deep depression whilst recording her second album and was found dead at her home by her record company. They subsequently replaced her to keep the label going. Others speculate Lavigne was murdered, perhaps even by Vandella herself, or passed away unexpectedly in a skiing accident. Twitter, why do you have to go and make things so complicated? A vast array of ‘evidence’ has been tossed around Twitter after the conspiracy rose again over the weekend. One concrete piece of evidence is that Avril only wears pants on the red carpet, whilst Melissa prefers dresses; therefore Avril died in 2003. Apparently a woman cannot change her fashion style over a number of years. What The Hell, how can we argue with that logic? Keep Holding On though, there’s more. 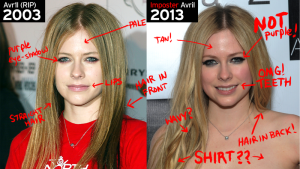 Two photographs of Lavigne, from 2003 and 2013, show her face is not exactly the same. Forget make-up, cameras and lighting; forget that there are ten years between these two photographs (and yeah, things can change); forget that celebrities can have plastic surgery and Photoshop, here is unadulterated proof of Lavigne’s clone-hood. Songs such as My Happy Ending and Nobody’s Home are argued to be ‘goodbye messages’ to Lavigne’s fans. Similarly, a television interview where Lavigne was confronted with the theory and “fumbled” a response, is being used as ‘evidence’ to support the conspiracy. This image of Lavigne posing with “Melissa” written on her wrist has resurfaced, and has only added fuel to the social media fire. 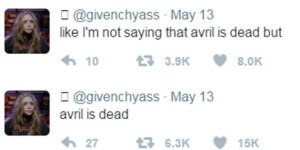 The mainstream Twitter conclusion is that until Lavigne posts a picture of the two women together, she is assumed to be dead. Until then, it seems, Twitter can sing “see you later boy” to logical reasoning.